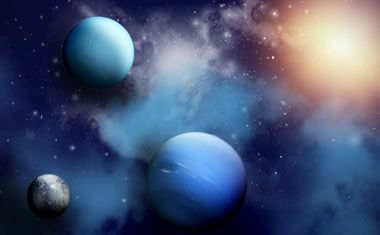 Uranus and Neptune were discovered through telescope in 781 AD by Herschel, but their calculated position never matched with original one. It was corrected by German Astronomers in 1846 AD. But Sage Veda Vyas mentioned Uranus, Neptune and Pluto in his epic poem Mahabharata (written more than 5000 years back in india). Vyas has named them as Sweta, Syama and Teekshana. Here Vyas states that some greenish white (Sweta) planet has crossed Chitra Nakshatra. Neelakantha of 17th century also had the knowledge of Uranus or Sweta. Sweta means greenish white, which was later discovered to be the color of Uranus. Neelakantha writes in his commentary on Mahabharat (Udyog 143) that Shveta, or Mahapata(one which has greater orbit) was a famous planet in the Astronomical science of India. Neelakantha calls this “Mahapata” which means having greater orbit and it indicates a planet beyond Saturn. Vyas mentions that a bluish white (Syama) planet was in Jyeshtha and it was smoky (Sadhoom). Neelkantha calls it “Parigha” (circumference) in his commentary on Mahabharat. He could mean that its orbit was almost of the circumference of our solar system. How did Sage Vyas see color of these planets ? Mirrors and Microscopic Vision are mentioned in Mahabharata (Shanti A. 15,308). So, lenses and telescopes must also be present at that time. In ancient literature, Durbini (device used to see objects at far off distance, similar to binoculars) were mentioned. Pluto was discovered to the modern world in 1930. Here Vyas states that some immobile liminary troubling Krittika (Pleides) with its sharp rays. This was mentioned as Nakshatra because it was stationary at one place for long period, so it must be a planet in outer orbit. Mathematical calculations make it clear that Krittika and Pluto were conjunct during mahabharata period. Vyas has mentioned ‘seven Great planets‘, three times in Mahabharat. It means that the seven great planets were brilliant and shining. In traditional indian astrology, Rahu and Ketu are nodes/shadows and do not shine like stars or planets. This line states that these seven great planets were ‘seen‘ moving away from the Sun. Since Rahu & Ketu cannot be ‘seen’, they can be ruled out. This statement is made on sixteenth day of Kurukshetra War, so the Moon has moved away from Sun. Hence we can assume Mars, Mercury, Jupiter, Venus, Saturn, Uranus and Neptune are the seven great planets mentioned by Vyas. Pluto was neglected due to its lesser impact on earth. Here again seven planets are mentioned by Vyas, excluding the Moon. Though they were described 5100 years back, we forgot about Uranus, Neptune and Pluto because in traditional indian astrology because they were not used to predict future.